SCVHistory.com HS1804 | Visual Art | (3) Oil Paintings by W. Lloyd Houghton of Newhall, 20th Cent. 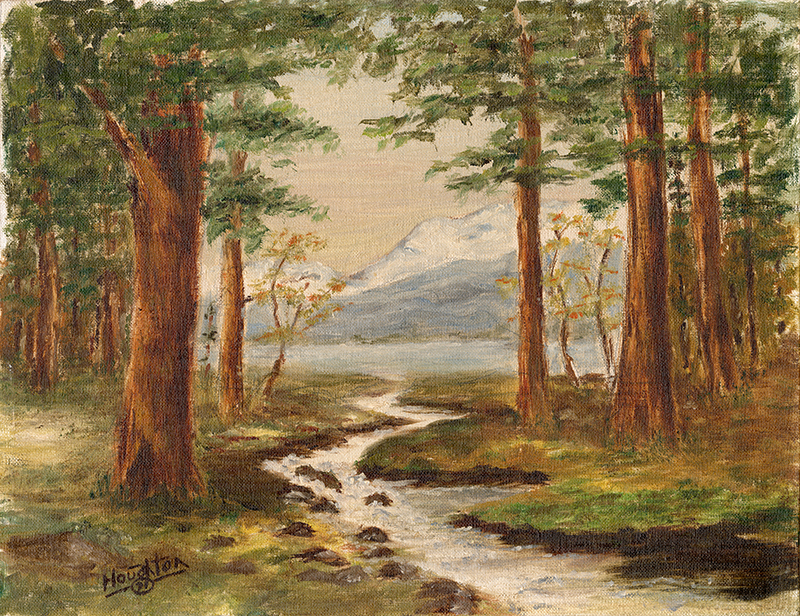 Three oil-on-canvas paintings by W. Lloyd Houghton (1893-1983), donated in November 2018 to the Santa Clarita Valley Historical Society by Cynthia Harris. Two are undated and the third appears to say "71," suggesting 1971. In addition to being a professional artist who created greeting cards during the first few decades of the 20th Century, Houghton acquired the derelict general store at Railroad Avenue and Market Street in Newhall in 1919 and transformed it into the Hap-A-Lan dance hall, which served as the local community center and Masonic lodge until 1928 when the building was used as a temporary morgue for victims of the St. Francis Dam Disaster and subsequently razed. Houghton's daughter, 1980 SCV Woman of the Year Betty Pember (1921-1992), gave the paintings to Harris, her friend and colleague in several local heritage organizations. Read more about Houghton here. Paintings are untitled. Download archival scans to see brush strokes. Note that small strands of hair (presumably the artist's) are embedded in the oil. 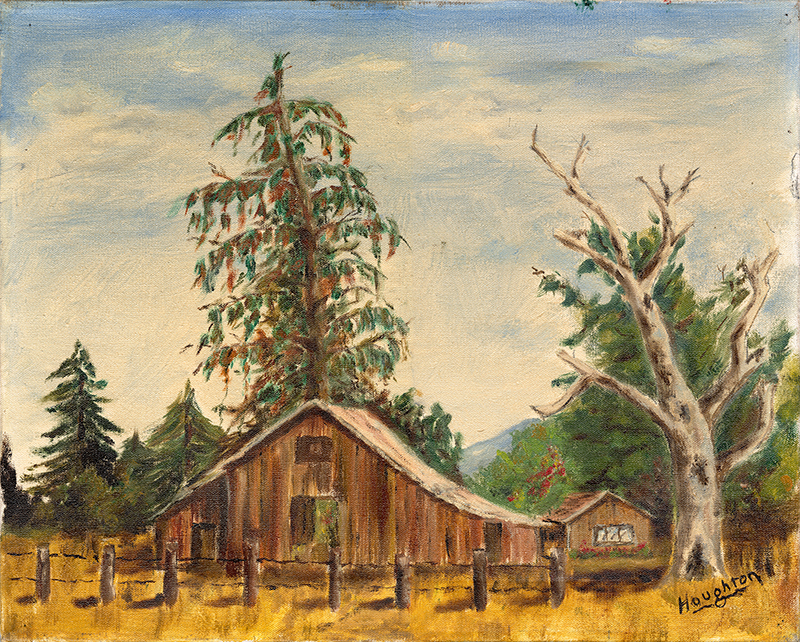 ABOVE: Barn scene with cabin, trees, bobwire fence, mountain in background. Oil on canvas, 16x20 inches. Signed "Houghton." No other writing. Unframed. BELOW: Woods, creek, lake, snowy mountains. Oil on canvas, 11x14 inches. Signed "Houghton" with what appears to be "71" in circle. Framed; the frame bears a copyright date of 1969 (Trieste Company USA). 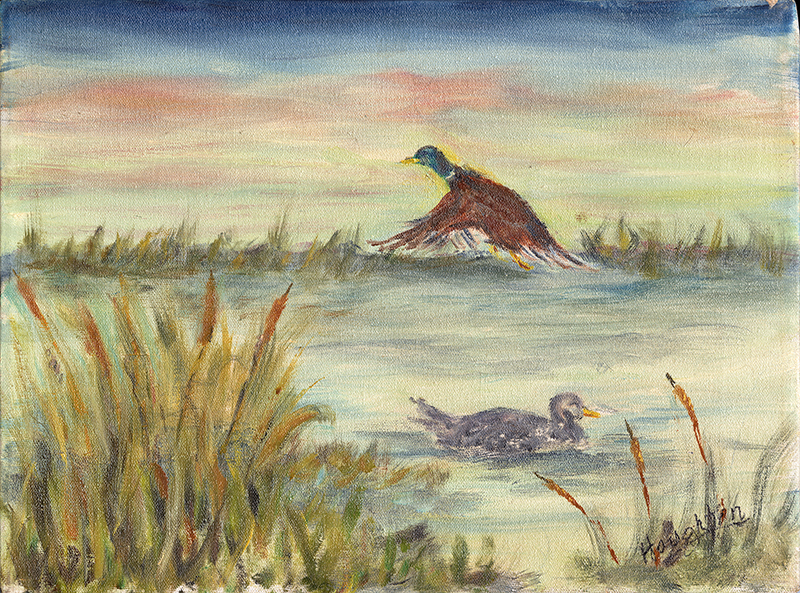 BOTTOM: Waterfowl (2), marsh with reeds. Oil on canvas, 12x16 inches. Signed "Houghton." Signature also appears on back of canvas. Framed; no other markings. HS1804: 9600 dpi jpegs from original paintings donated 2018 by Cynthia Harris. SCV Historical Society collection.